The forced deportation of Myanmar’s Rohingya Muslims to Bangladesh is a violation of international law, says former law and foreign affairs minister Kamal Hossain. Observing that the situation created out this crisis is a threat to international peace and order, he insists that the United Nations Security Council (UNSC) should act promptly. He advocated that Bangladesh should take a proactive position on the matter of supporting the International Criminal Court’s move to try perpetrators of persecution of Rohingyas, which is widely considered as crimes against humanity. Kamal Hossain spoke to Prothom Alo on the critical issue of possible ICC’s trial of Myanmar on charge of crime against humanity, on Thursday hours before leaving Dhaka to receive an honorary degree from his alma mater, the University of Notre Dame, Indiana, USA, as “a champion of human rights in his pursuit of justice”. On 7 May, the Pre-Trial Chamber of The Hague-based ICC invited Bangladesh to submit observations about the initiation of the proceedings against Myanmar within 11 June 2018. The development came when the ICC’s Gambian-origin chief prosecutor Fatou Bensouda suo moto sought to invoke the world court’s jurisdiction over Myanmar, a state that has deliberately kept itself out of the court’s jurisdiction. Prothom Alo: How do you see the possible trial of Myanmar on charges of crime against humanity at the ICC? 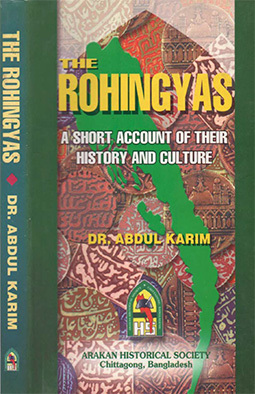 Kamal Hossain: The rights group Fortify Rights has urged and said that it would support steps to hold Myanmar military regime accountable for international crime against the Rohingyas. The forced deportation of hundreds of thousands of Rohingya people from Myanmar being forcibly pushed into the territory of Bangladesh is violation of international law. The Chief Prosecutor Fatou Bensouda of the ICC filed a request on the question of exercising the court’s jurisdiction over the alleged deportation of Rohingya people from Myanmar to Bangladesh and committing crimes against humanity. On 11 April, the resident of the pre trial division assigned Bensouda’s request to the Chamber. Under article 19(3) of the Rome statute, the prosecutor may seek such ruling from the court regarding the jurisdiction and admissibility. 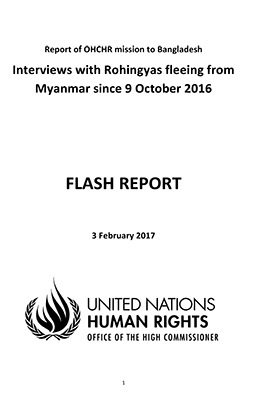 The rights group Fortify cited reports by HRW and other public information and rights agencies and confirmed that crimes of deportation were committed against the Rohingyas. Prosecutor Benduda also cited the special rapporteur on Myanmar who said that the situation bears “hallmarks of genocide.’’ The ICC prosecutor Bensuda is correct in her assessment that it is not only the abstract questions of jurisdictions but concrete steps are needed, that could ultimate save lives of the distressed Rohingyas. Prothom Alo: Should the court exercise its jurisdiction? Kamal Hossain: Maybe this would be the very appropriate case for the ICC to exercise the jurisdiction because it is difficult to underestimate a situation where nearly a million people were uprooted forcibly from their home where they lived for many, many years. I believe the UN should do everything to ensure that the ICC entertain this complaint and take appropriate steps to prosecute the crime against international law. I am told that one hundred thousand pregnant women were pushed out in this inhuman act of forced deportation. I believe there was no single instance that could have happened in peace time and particularly in absence of any conflict. Just people were pulled and pushed out through border. It is unprecedented. It is something that the international community cannot take lightly. The ICC itself has a proactive and positive role. They are now asking Bangladesh to cooperate and it shows that this world justice body is inclined to take a positive role and examining the matter and seeing that the international law is respected. I think it is very positive action on the part of the ICC and they are asking Bangladesh to play its part. Bangladesh should take due note of it and respond in a very positive way since the court itself has shown a positive attitude. Prothom Alo: The ICC prosecutor has in fact pleaded in favour of admissibility? Kamal Hossain: I definitely appreciate such a proactive role that was played by someone like her. It shows that the different parts of the international community are concerned about what is happening in this part of the world. Few hundred of thousands people had been forcibly pushed out from one country to another over a settled border. If a state commits such an act with impunity that could lead to upsetting the whole international order and law. It is a very gross kind of violation of international law. Prothom Alo: Has genocide been committed? Kamal Hossain: Yes. It’s an international crime. Even only forcing out the thousands of people over a settle border itself is a serious offence with grave consequence. Prothom Alo: In response to ICC move, Myanmar claimed that they did not deport anybody, they are displaced to Bangladesh. Kamal Hossain: How could it happen? Are they voluntarily “displaced’’ from the soil of their homeland? From the aerial view, now it is seen that their homes and villages were bulldozed, burnt and destroyed, and the land is now being prepared for some foreign investment! That is absolutely inhuman action that has been taken place. Prothom Alo: Do you see other alternatives to take action against this rogue state under international law since the functioning of ICC might depend upon the UNSC resolution? Kamal Hossain: It would be safest if the UNSC passed a resolution to take this matter into the international court. In terms of legal procedure, that would be the best course. There are other alternatives that may have to be thought but a resolution from the UNSC is the best. Prothom Alo: The Security Council has scheduled an open briefing on their recent delegation’s trip to Bangladesh on 14 May. 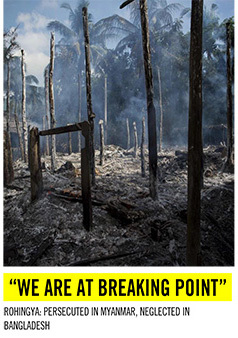 But the latest reports indicated that China does not want UN to push Myanmar on accountability. Kamal Hossain: I very earnestly appeal to the members of UNSC to pass a resolution that could enable the ICC to look into the matter in due process. The whole international law and the UN’s credibility will be called into question if they cannot rise to such matter of its kind. Prothom Alo: What about your experience in Afghanistan? Kamal Hossain: Thousands of people were forcefully pushed through the Iran and Pakistan borders, a situation similar to the present Rohingya people of Myanmar. It was a gross violation of human rights and about which I have submitted number of reports to the UN and Security Council. I have reason to believe that the ICC will take contingence and would be able to the perpetrators bring into book.